Impact of a water droplet. The coexistence of the solid, liquid, and gaseous phases of water on Earth is perhaps vital to the origin and evolution of life on Earth as we know it. However, if the Earth's location in the solar system was marginally closer or further from the Sun, the conditions which allow the three forms to be present simultaneously would have been more unlikely. Earth's mass allows gravity to hold an atmosphere. Water vapor and carbon dioxide in the atmosphere provides a greenhouse effect which helps maintain a relatively steady surface temperature. If Earth were less massive, a thinner atmosphere would cause temperature extremes preventing the accumulation of water except in polar ice caps (as on Mars). According to the solar nebula model of the solar system's formation, Earth's mass may be largely due to its distance from the Sun. The distance between Earth and the Sun and the combination of solar radiation received and the greenhouse effect of an atmosphere ensures that its surface is neither too cold nor too hot for liquid water. If Earth were more distant, most water would be frozen. 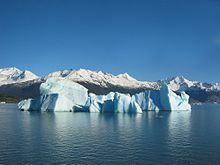 If Earth was nearer to the Sun, its higher surface temperature would limit the formation of ice caps, or cause water to exist only as vapor. In the former case, the low albedo of oceans would cause Earth to absorb more solar energy. In the second a runaway greenhouse effect and inhospitable conditions similar to Venus would result. It has been proposed that life itself may maintain the conditions that have allowed its continued existence. The surface temperature पृथ्वीको has been relatively constant through geologic time despite varying solar flux, indicating that a dynamic process governs Earth's temperature via a combination of greenhouse gases and surface or atmospheric albedo. See Gaia hypothesis. See water resources for information about fresh water supplies. Water is a strategic resource for many countries. Many battles and wars, such as the Six-Day War in the Middle East, have been fought to gain access to it. Experts predict more trouble ahead because of the world's growing population, increasing contamination through pollution and global warming. UNESCO's World Water Development Report (WWDR, २००३) from its World Water Assessment Program indicates that, in the next २० years, the quantity of water available to everyone is predicted to decrease by ३०%. ४०% of the world's inhabitants currently have insufficient fresh water for minimal hygiene. More than २.२ million people died in 2000 from diseases related to the consumption of contaminated water or drought. In २००४, the UK charity WaterAid reported that a child dies every १५ seconds due to easily preventable water-related diseases. Some have predicted that clean water will become the "next oil", making Canada, with this resource in abundance, possibly the richest country in the world. deepak sk nepal Kanchanpur Jhilmila == मानव संस्कृतिमा पानी == प्राय सबै धर्महरूमा पानीलाई शुद्ध बनाउने वस्तुको रूपमा लिइन्छ। क्रिस्चियन, हिन्दु, मुसलमान, यहुदी र शिख सबैले पानीलाई महत्व दिन्छन्। क्रिस्चियन धर्म मान्नेहरूले पानीले बप्तिस्मा लिने गर्दछन् भने मुसलमान, यहुदी र हिन्दुहरूले स्नान गर्न शुद्ध पानीकै प्रयोग गर्छन्। विभिन्न समुदायका मानिसहरूले व्यक्तिगत तथा अन्य सामाग्रिहरूको सरसफाईका लागि पानीको प्रयोग गर्छन्। Water is often given spiritual powers. In Celtic mythology, Sulis is the local goddess of thermal springs; in Hinduism, the Ganga is also personified as a goddess. Alternatively, gods can be patrons of particular springs, river or lakes: for example in Greek and Roman mythology, Peneus was a river god, one of the three thousand Oceanids. Empedocles, a Greek philosopher maintained that water is one of the four classical elements along with fire, earth and air, and was regarded as the ylem, or basic stuff of the universe. Water was considered cold and moist. In the theory of the four bodily humours, water was associated with phlegm. Water was also one of the Five Elements in traditional Chinese philosophy, along with earth,fire, wood, and metal. Scientific Facts on Water disinfectants A faithful summary by GreenFacts of a leading scientific consensus report on Drinking Water Disinfectants published by the International Programme on Chemical Safety of the WHO. Tap Water Vs Bottled Water - Interesting site providing facts about tap and bottled water. E the Environmental Magazine piece on bottled water (Oct २००३).